I guess eveyone knows what an omelette is, so no need for further explanation. But I guess not a lot know whats the secret to a fluffy one. There are two ways, one is by using cream or milk creating watter bubble vapours inside and another one is just aerating the egg whites then fold the egg yolks. Giving it air gives that light and fluffy texture. 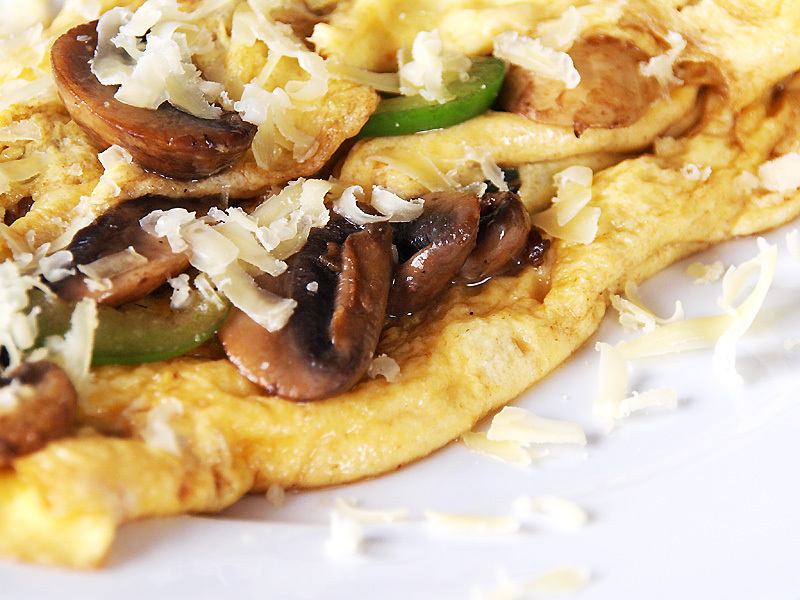 Also if you will be adding some mushrooms, vegetables or other ingredients its best to cook those separately then just place it on top before folding the omelette, this way you can ensure that the fillings are cooked and eggs are not over cooked and retain that moisture. Omelette according to history might have originated in Ancient Near-East which is now the Modern Middle East where eggs were beaten and herbs served as the fillings, it then later on travelled to Western Europe which gave birth to the local versions like the Spanish Tortilla, French Omelette and Italian Frittata. Now for this recipe, it will be a simple mushroom and capsicum omelette which is really good for breakfast paired with toast. Separate egg white and yolk, then beat egg whites until fluffy. Add cream, dash of salt and freshly ground black pepper to egg whites then continue to beat until evenly mixed. Now fold in the yolk to the egg white mixture. Now add the remaining butter in the pan then pour egg mixture. Now place the topping while top is still wet. Cook until the top is still moist but not runny. Fold the eggs in half then place in plate. Serve with grated cheese on top while hot. Wow hubby and my son loves egg and cheese. This is a new twist of Omelette I am sure they would love. Thanks again. I love all your recipes here and I would definitely try one of those for my love ones.